Doukyuusei (Classmates) is considered by many to be the first true date sim game. The third game of Doukyuusei lineage is known as Kaykyuusei (Underclassmen). Unlike the first two games, Kakyuusei is a more romance oriented game, focusing on interacting with various girls. Fairly popular in its day, Kakyuusei saw both OVA and TV series releases. While nothing revolutionary, they have a lot of charm and rather good stories. I especially liked how story elements in the game were used in creating pure-bred anime romance, using many of the elements we see as nearly cliché in modern times. 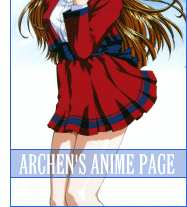 As a sincere and fairly simple romance anime (with fan service *cough*), I've always had a soft spot for this series. Unfortunately it never saw commercial release in America.